Several hundreds of people protested today, Sunday October 2, 2011 in Grohnde (Lower Saxony). After a demonstration the access roads to the NPP are blockaded by climbing activists who abseiled from a highway bridge. They are supported by some 50 activists blockading the road and an operating track with a sit-in. A second access road is blocked by an announced and permitted anti-nuclear concert in front of the atomic power station. Though police new about the action day, they could not prevent the blockades. Fr. Moon Jung-Hyun (white beard) and Br. 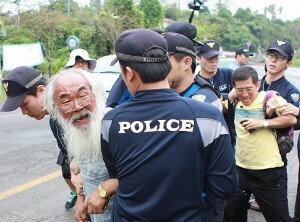 Park Do-Hyon, SJ, (yellow shirt), under arrest. Seven of the fifteen people have been in jail since August 24 or September 2, charged with violating posted orders not to obstruct the commerce of the private construction companies. At least three dozen people were arrested during a series of massive police raids on the village and coastal peace camp on those days, which cleared the contested site for creation of a construction gate.